FRIDAY NOV. 2 (Valhalla, NY) – Sophomore Monte Lambert (Brooklyn, NY/James Madison HS) began his Westchester Community College career with a 20-point night, and sophomore Miles Haughton (Mamaroneck, NY/Mamaroneck HS) scored 17 points. The Westchester Community College Men’s Basketball team opened the 2018-19 season with an 88-77 win over Kingsborough Community College on Friday night at Viking Gymnasium. The win was the second half of a doubleheader as part of the Westchester Community College Tip-off featuring four games over two days. Westchester led 52-43 at halftime, and never looked back. Also for the Vikings, Alhagieboe Dukuray (Brooklyn, NY/University Prep) had 13 points, while Joe Zayer (West Nyack, NY/Clarkstown South HS) added 14 points. SATURDAY NOVEMBER 3 (Valhalla, NY) – It might have been the most challenging double-digit win the Westchester Community College Men’s Basketball team may experience this season, but in the end, it also could be the most satisfying. They trailed the entire first half, at one point by as many as 12 points, allowed a buzzer-beating three-pointer to end the opening stanza with a seven-point deficit, and struggled to find a rhythm for the first 20 minutes of play. 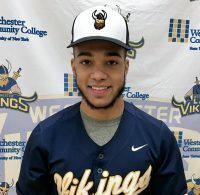 But, thanks to speed, depth, and a gritty second half effort that became a dominant performance, the Vikings opened the 2018-19 season a 2-0 team after an 85-73 win over visiting Union County College on Saturday at Viking Gymnasium. Both wins came as part of the Westchester Community College Tip-off that featured five teams competing over two days. Where Union County (1-1) dominated the first half with size and hot shooting, Westchester dominated the second half with depth. Almost immediately after the break, the Vikings took over the game, opening the second stanza on an 11-1 run to take their first lead of the game, 50-47. From there, it became a fight to the finish during the final 15 minutes with seven different lead changes. Tied 66-66 with 6:43 to play, the Vikings outscored Union 19-6 during the home stretch of play to claim victory. Sophomore Monte Lambert (Brooklyn, NY/James Madison HS) earned game MVP honors with a career-high 21 points. He also added six rebounds. Also for Westchester, sophomore Miles Haughton (Mamaroneck, NY/Mamaroneck HS) shined once again, scoring 19 points, and adding seven rebounds, three assists, and four blocked shots. His alley-oop dunk off a beautiful pass by Jon Brennan (Irvington, NY/Iona Prep) with 7:10 to play gave Westchester a two-point lead, and appeared to deflate Union. Also for Westchester, freshman Joe Zayer (West Nyack, NY/Clarkstown South HS) scored 17 points, and added seven rebounds, five assists, and four steals. While freshman Alhagieboe Dukuray (Bronx, NY/University Prep) gave WCC 17 huge minutes off the bench, chipping in six points, three rebounds, and three huge steals. Overall, 10 different Vikings scored. Overall, Westchester shot 47.7% for the game, and made nine three-pointers. They also out-rebounded Union 47-38. Perhaps the most important stat of the game was to the credit of the Viking defense as Union shot only 25.7 percent from the floor during the final 20 minutes after opening the game at 45.5% during the first half.